Taking a vacation or even simple travel can become a hassle when you don’t have the proper paperwork that comes with it. The Immunization Sheet was designed to help you remember all the important information when it comes to your or your family’s health. All you’ll need to enter into this simple Excel spreadsheet is the information for diseases and associated inoculations. It’s that simple. You can now have the peace of mind you need when traveling by making sure your health is in perfect care with this free template, download today to get started. There will be a section at the top to enter your personal information, such as your name, birthdate, and any medical notes that you need to mention to your doctor at the time of your visit. In the sections highlighted in red, there are columns for vaccines, types, the date given, administered by, and the date you need to receive the next dose. Go through the first column and enter the vaccines that you will need or that you already have been given in place of these examples. 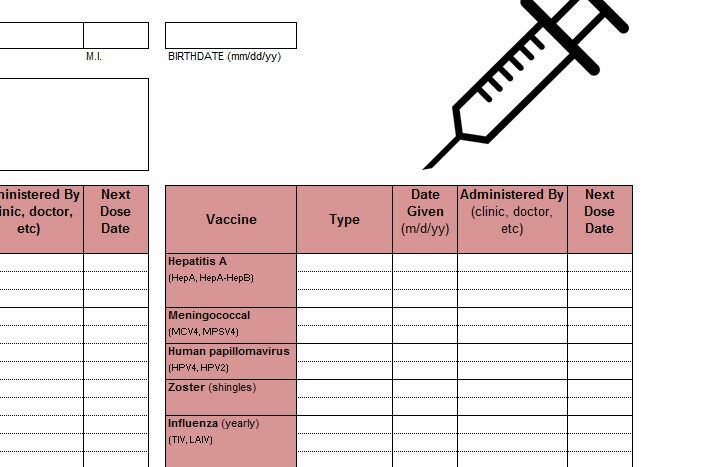 In the next table over, you will simply fill out the same information for other vaccines; it just gives you more space to list items. In the bottom of this section, however, you will see a handy “Notes” section. Here, you can list doctor appointments and other helpful items that will get you ready for your journey or just keep you in good health. When you have developed a list of all your previous vaccines and upcoming ones, you can print the Immunization Sheet be selecting “File” then “Print” at the top of the page. Now, you can keep a complete record of your vaccine history in the palm of your hand.